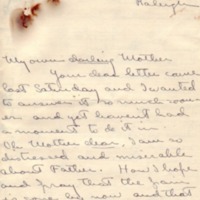 Your dear letter came last Saturday and I wanted to answer it so much sooner and yet havent had a moment to do it in. Oh Mother dear, I am so distressed and miserable about Father. How I hope and pray that the pain is gone by now and that he will be better soon. Oh I love him so and I can't bear to think how he must be suffering. It will be well in time, won't it? And are you very much worried about him? Oh, how I wish I was there with you all now. The days are going so slowly and I dont think the nineteenth will ever come. How I wish I could see my darling Father and you right now! Margaret hasn't come to Raleigh yet though we are expecting her tomorrow or the next day. Aunt Annie wrote her day before yesterday that she could have a room at the Exchange Hotel. I think that she has been expecting to start for home on Monday, the sixteenth. But I don't know what her plans will be when she hears from you, though I should think by the sixteenth it will be alright for her to start, though, won't it? When are you all going to go away and how long will you stay? If Margaret does go next Monday I wish I could go with her as it is only three days early and I wouldnt miss very much. Do you think I could or had I better wait till school is really over? I hope you all can get away from Princeton for a while because I know that it would do father good. You are both going to Bermuda after Christmas, aren't you? Oh, I hope you will. If you don't think that it is best for me to go up with Margaret, then, if you approve I will do what one of the girls who lives in Buffalo has just asked me to do - go up with her as far as Washington on the "Southern", instead of the Seaboard as she has an extra pass that she wants me to use. But it really would seem silly for Margaret and I to go up at dif only three days apart from each other, so she had better wait until Thursday for me or else I can start on Monday with her. Which of all these things had I better do? I am afraid that this letter is terribly mixed up and unintelligible, but I do want to get home so much and as soon as possible and so I can't write coherently. I am still very well and everything is going on as usual down here. Aunt Annie and Annie both send dear love. Darling, darling Mother I love you so, so dearly. Tell Father how much I love him and kiss him for me. Oh I hope that the pain is gone. P.S. Are you still well your-self and is your foot hurting you anymore? McAdoo, Eleanor Wilson, 1889-1967, “Eleanor Randolph Wilson McAdoo to Ellen Axson Wilson,” 1907 December 10, WWP19553, Eleanor Wilson McAdoo Collection at the University of California-Santa Barbara, Woodrow Wilson Presidential Library & Museum, Staunton, Virginia.